Notice: This is an old thread. The last post was 2623 days ago. If your post is not directly related to this discussion please consider making a new thread. 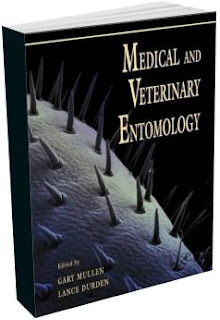 Medical and Veterinary Entomology is a comprehensive text and is primarily intended for graduate students and upper level undergraduates studying the medical and veterinary significance of insects and related arthropods. The book will also appeal to a larger audience, specialists and non-specialists alike, including entomologists, parasitologists, biologists, epidemiologists, physicians, public health personnel, veterinarians, wildlife specialists and others looking for a readable, authoritative book on this topic. The first two chapters provide overviews of medical-veterinary entomology and epidemiology, respectively. These are followed by individual chapters devoted to each group of insects or arachnids of medical-veterinary importance and the health problems they can cause including their role as vectors of pathogens. Each of these chapters provides an overview of the taxonomy, biology and ecology of the group, and is followed by separate sections on their medical and veterinary importance, then by a section on prevention and control and, finally, by a list of references and further reading. Last edited by Motoko; 31st March 2012 at 03:23 AM. Reason: EXTRACT ACTIVE & UPDATE SOURCES.